Taisu Zhang is an Associate Professor of Law at Yale Law School and works on comparative legal history—specifically, economic institutions in modern China and early modern Western Europe—comparative law, property law, and contemporary Chinese Law. 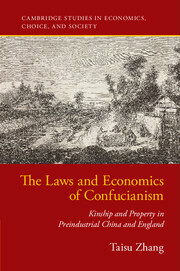 Cambridge University Press: Tying together cultural history, legal history, and institutional economics, The Laws and Economics of Confucianism: Kinship and Property in Pre-Industrial China and England offers a novel argument as to why Chinese and English pre-industrial economic development went down different paths. The dominance of Neo-Confucian social hierarchies in Late Imperial and Republican China, under which advanced age and generational seniority were the primary determinants of sociopolitical status, allowed many poor but senior individuals to possess status and political authority highly disproportionate to their wealth. In comparison, landed wealth was a fairly strict prerequisite for high status and authority in the far more “individualist” society of early modern England, essentially excluding low-income individuals from secular positions of prestige and leadership. Zhang argues that this social difference had major consequences for property institutions and agricultural production.